The tradition of shrimp fishing dates back to the 13th century, but it is an art that almost died out. Not long ago, only three mounted shrimp fisherman remained. That number has grown to 19 as people in the Belgian village of Oostduinkerke work to sustain their cultural heritage. Fishing does not come naturally to the horses. 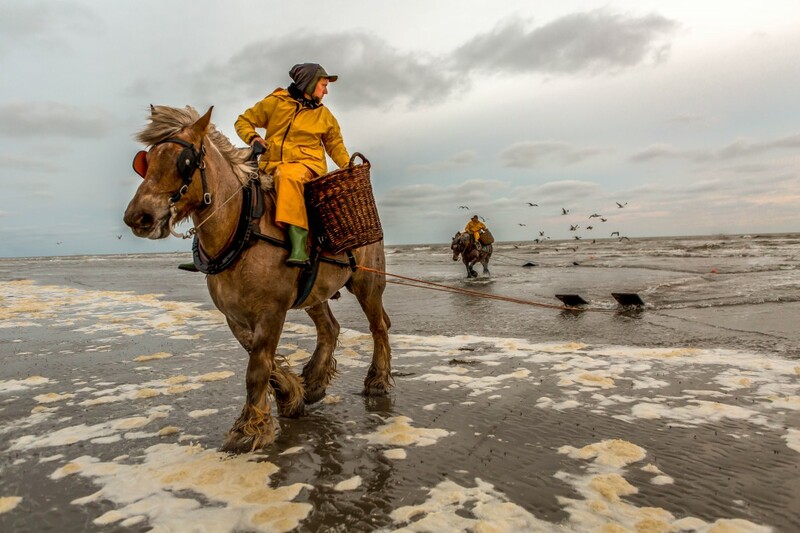 The strong Brabant draft horses needed to pull the heavy nets must be trained to enter the ocean, where they are guided by their riders to the areas populated by grey shrimp. Once a horse is found, it stays with the fisherman for life. Shrimp fishing takes place twice a week during the season, and each horse brings back between 22 and 44 pounds of fish per day. Gone are the days when mounted fisherman used their catch to fertilize their fields; today the gray shrimp they catch are boiled and served up to tourists, sometimes right on the beach. For a longer video and a profile of another of the fishing families, please watch the video from Unesco, below. What a fascinating report on shrimp fishing using horses. Love a story about local breeds and cultural history. Definitely on my wish list of things to see.